To provide some context, I like to start with my story. After twenty years searching for solutions for lower back pain and sciatica, I’ve been virtually free from pain now for over seven years – since becoming involved with The Reconnection and Reconnective Healing. Growing up with scoliosis didn’t mean having back pain for me, just some discomfort and embarrassment. It wasn’t until I was in my late twenties that I found out about lower back pain. I spent the next week in bed between doctor’s appointments. Our GP at the time was Dr. Jim Duff who also practiced homeopathy and acupuncture. 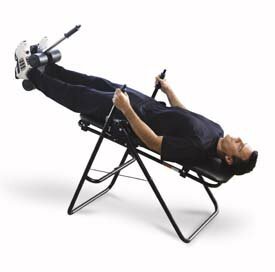 And he loaned us an inversion table that had me stretched out and almost hanging from my ankles to take the pressure off my sciatic nerve. It helped, and I recovered after a week or so. However, after that and for the next twenty years I had to get a tune-up from my Chiropractor/Kinesiologist every six to eight weeks to help me stay pain free and balanced. "You’d be good at this!" Then the day came, in 2007, when I let myself in for a tremendous amount of stress (that’s quite another story which I tell here) and the resulting shoulder pain and lower back pain even my Chiropractor couldn’t help. He recommended I try either a Bowen therapist or some acupuncture. I ended up at the Body Balance Center in Hobart, Tasmania with Katerina having a Bowen treatment. It was one of those pivotal moments in my life. Lying there, looking down through the massage table head hole, I had the thought that I’d like to learn to do this too! After all, she was “just” doing a few gentle moves on my muscles and tendons then leaving me for a few minutes to “process”. A few weeks later I was enrolled in a course in Bowen Therapy. And I was OK at it too, but that wasn’t to be the perfect fit for me, rather it was a preparation for something. I learned that healing can happen on a purely energetic level, without even needing to physically touch the person! Here’s what happened…and how it led to me becoming a Reconnective Healing Practitioner and finding my present path. A family member had inherited my scoliosis with the resultant lower back pain and, after a series of treatments from complimentary therapists including Chiropractic, Osteopathic and Kinesiology, we were resigned to the need for surgical intervention in order to stop the degeneration of the spinal curve. At the time I was mid-way through the Bowen Therapy course, so I asked my trainer if there was anything I could do to help the patient recover. She said that I wouldn’t be able to use touch but that I could do a “surrogate” procedure where I had his mother hold his hand while I did a few moves on her back. This, she said would help the patient come out of the effects of the anesthetic. So it was on the second day after the six-hour operation that I remembered the advice. The drains were still in the patient’s chest, the morphine pump was dripping on demand with the patient fast asleep. With his mother holding his hand, I did the few Bowen moves on her back. Immediately, the patient woke up and looked at us. “I can feel my back! I don’t want to feel my back!” he complained, and went promptly back to sleep! We were in shock! This stuff actually works! It was experiences like this that re-opened my eyes to the reality of energy healing. I should have remembered also that, during the 1990s, I’d often used Reiki to great effect for myself and my children. In fact it was the main thing that helped one of my children cope with childhood asthma. OK enough of my story, now let's get practical! Dehydration can be a major source of pain, and today many of us have even lost touch with our sense of thirst for water, believing that other fluids are better. Tea, coffee, soft drinks and cordials, even fruit juices don’t satisfy the body’s needs for water. My simple advice: rather than drinking a certain amount of water a day, listen to your thirst and be aware of not only the quantity but also the quality of the water you drink: use a filter or be the filter for your water. Avoid bottled water. If your tap water is chlorinated like our is, pour a glass and let it stand for a few minutes and most of the chlorine will evaporate before you drink it. If you want to get rid of the fluoride in your water I understand that a reverse osmosis filter system is necessary. A much less expensive system that you can make yourself is available from the Keshe Foundation. Walking, swimming – or any gentle, appropriate exercise – is the next solution for lower back pain. In acute stages perhaps the best professional to advise you about exercise is a Physiotherapist (or Physical Therapist). I recently read a Choice magazine survey of 770 of its readers regarding their favored solutions for lower back pain and Physiotherapy was rated at 79% satisfaction, Chiropractic at 73% and other treatments including Bowen and Acupuncture also rated well. "What is pain? It's a wake-up call: "Wake Up!" pain says, "Hello, haven't we been a little unconscious lately?! Awaken! Understand your mortality and understand your immortality...pay attention to the immortal part of you." What is this pain telling me? To change some aspect of my daily routine or diet? To do a detox by avoiding stimulants like coffee or alcohol for a few days? What have I been ignoring? Who do I need to forgive - or what aspect of myself and my behaviour do I need to forgive? I can hardly think of any problem that cannot be solved if a little more consciousness is used. Sometimes just a very small change in awareness solves a problem and this change can happen at any time with almost any catalyst. Another felt, during her Reconnective Healing session that she was being “manipulated, stretched and defragmented.” This was just as amazing for me as I was standing about two meters away observing her pelvic muscles ripple as if someone was massaging her! So yes, Reconnective Healing can help even at a distance. Others find that their pain persists and that they do need to seek the help of a physical therapist. For some, that realization itself is their healing. I’ve known people who are closed off from consulting a doctor for fear of being given the wrong medication or treatment. There is a time and place for everything and only you can decide what’s best for you. You might like to download and share an updated version of this article. Because the majority of my clients have initially presented with back and neck pain, I've written an article that describes the three best solutions we've found. 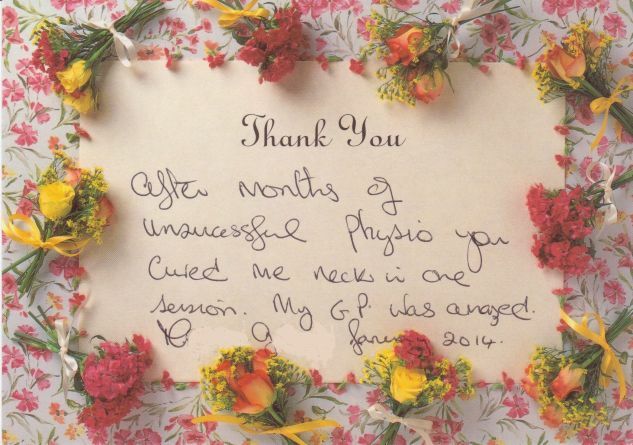 In January 2014 Maureen G wrote "After months of unsuccessful physio you cured my neck in one session. My G.P. was amazed." If you have back pain now, contact me for a Reconnective Healing appointment either in person or via distance healing. Painful tooth? Help is at hand while you await the dentist.